Global warming and climate change leads to increased endosymbiotic archaeal growth. The differentiated cells by archaeal induction get converted to stem cell. The stem cell is an immature cell with loss of function. The neurons lose their dendritic spines and loss of connectivity. The brain function becomes primitive. The neurons are adendritic and disconnected. This results in complex brain structures like the modern cerebral cortex and prefrontal cortex atrophy. The primitive parts of the brain the brain stem and cerebellum hypertrophies. This results in neanderthalisation of the brain with a prominent occipital bun and atrophied prefrontal cortex. The prefrontal cortex atrophy results in loss of logic, judgment, reasoning and executive functions. The hypertrophy of the cerebellum and brain stem results in dominance of impulsive behaviour. The difference between reality and dreams is lost. 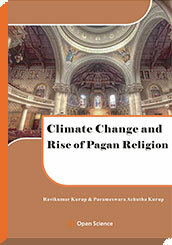 Climate change can lead on to spiritual and religious evolution with pagan religions focusing on the environment dominating the world stage.